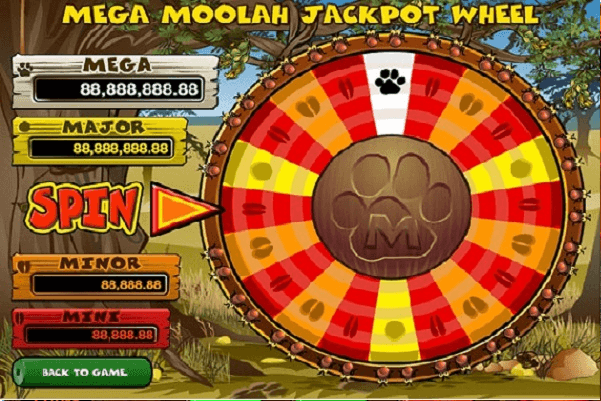 Mega Moolah is the name of not only a video slot game, but a progressive jackpot that can be won while playing the game at a Microgaming casino. This vibrant, colorful game provides a colorful portrayal of the jungle, complete with authentic-sounding effects and music. It’s not surprising that Mega Moolah is called the Daddy of all progressive slots because this is one of the most popular progressive jackpot slot game at the casinos be it off or online. Also Canadian players often win this slot machine. K.T. from Canada won CA$1.4 million on the 15th of November 2017. Prior to that 3.4 million was won on 4 November 2017. Another Canuck player grabbed a whopping CAD $7,561,773 million wins. Also so many players around the globe are seen winning this jackpot game. Latest a Grand Mondial Casino player won £4.2 million on the 18th of December 2017. A player won 1.4 million on the 1st of October 2017 just six days after the progressive was hit for the second largest payout of the year, which was a whopping 7.7 million euros won on the 25th of September 2017. The largest ever jackpot won on a cell phone device happened on the 28th of August 2017 when a player known only as D.P. won 7.9€ million! The jackpot was won on the popular Zodiac Casino where the player signed up to the 80 Chances to Become a Millionaire promotion! 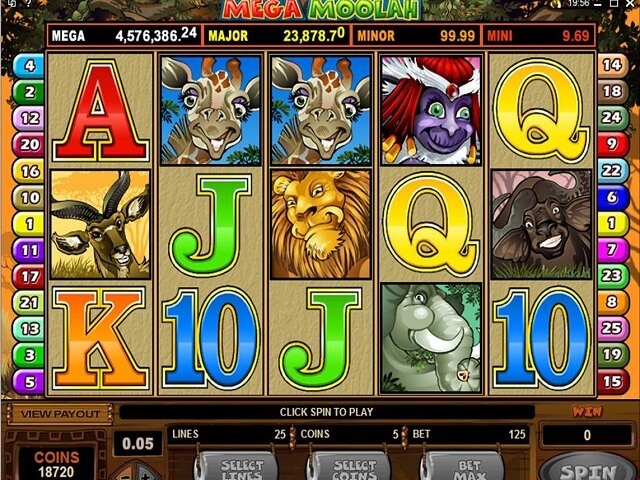 Mega Moolah slot game is all about the Four Progressive Jackpots that has created countless millionaires. Mega Moolah is known for having huge progressive jackpots, but there is more to this charming video slot than the promise of nice prizes. The colorful and endearing symbols feature friendly jungle characters, such as a lion, giraffe, elephant, zebra, and more. The classic 10-J-Q-K-A symbols are also included for added variety. As with all Microgaming slots, this game is user-friendly and very easy to play, with large buttons that are easy to find and click to customize your bets, etc., to your liking. You won’t have much of a choice when selecting coin values in Mega Moolah, as they only range from 1 to 5 cents. However, many people will likely be thrilled that they can play every line with the maximum amount of coins per line for just $6.25. The low maximum bet is pretty much par for the course when it comes to a progressive jackpot slot. Aside from the progressive jackpots, you can win a pretty large amount in the standard game with the base jackpot of 15,000 coins. This can become a 75,000 coin jackpot if you bet 5 coins per line, too. With free spins and wilds keeping you coming back for more the jackpot within the game (non-progressive) is a whopping 225,000 coins. In order to get the base jackpot of 15,000 coins, you will need to get five of the “wild lion” symbols on a single active payline. Again, the jackpot will also be multiplied by the number of coins you are betting per line, so the greater the risk, the greater your reward will be while playing this game. 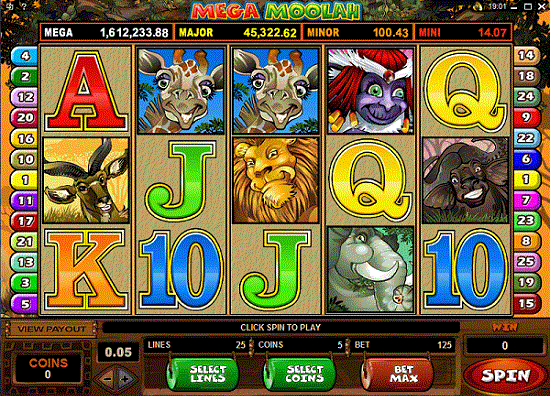 Mega Moolah features four progressive jackpots. The Mega Progressive jackpot starts at a whopping $1 million. The Major Progressive starts at $10,000. Finally, the Minor and Mini Progressive jackpots start at $100 and $10, respectively. The Mega Progressive jackpot has been won about every 11 weeks, with an average win of $2.8 million (all totals given in CAD). It has been won several times with a value of over $4 million, as a matter of fact. To win a progressive jackpot, you have to get into the “spin to win” bonus game. Now, you do not need to win or do anything else in order to get a chance to spin. You can be selected to spin at any time, even after a loss. However, you will have a better chance to be selected when you bet more, which is why people often bet the maximum amount on progressive slots like this one. Mega Moolah’s wild lion symbol appropriately serves as the wild symbol. It will substitute for any symbol in the game, with the exception of the scatter symbol. Furthermore, when the wild lion symbol is used to substitute for another symbol in a winning combination, it doubles your win. The scatter symbol is a monkey dressed like a sort of shaman, and he will bring you good tidings to the tune of 15 free spins if you obtain 3 or more of him and his brethren in a single spin. During free spins (which can be retriggered, by the way), all of your wins are tripled, which means you can win up to 225,000 coins if betting the full amount when you get five wild lions during free spins. There are several ways to play Mega Moolah. You can visit any Canadian reputed land casinos or online casino and enjoy this game directly from their games lobby. Also you can type the url of the online casino on your mobile, smartphone or tablet any play the game either for fun or for real money. Remember that there is no Mega Moolah app as the game is played in the browser be it your web browser or cell phone browser chrome or safari. Also you need to play this game with real money as no free play is offered for progressive slot machines. 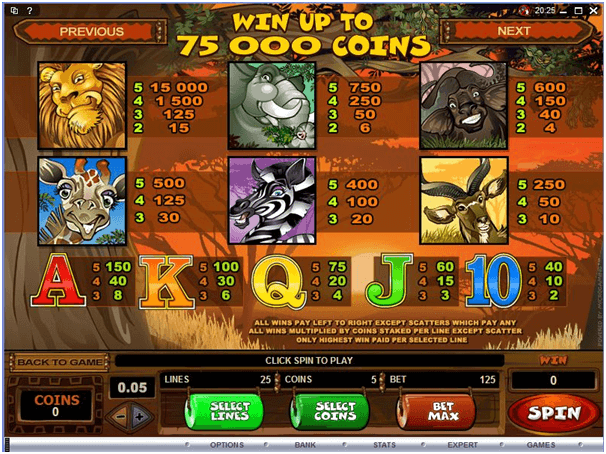 Players familiar with the game know that the jackpot resets to 1 million after the jackpot is won. However as the jackpot’s base currency is in British Pound Sterling, the jackpot does not necessarily reset to 1 million if the jackpot is won in a weaker currency than Pound Sterling. In the case of the Canadian jackpot win, 1 Canadian Dollar equals to 0.54 Pound Sterling at the time of the jackpot, hence the jackpot reset to roughly half from where it stood just prior to being triggered – to £3,469,553 to be exact. It is often the case that the jackpot is won in another currency than Pound Sterling. Players in respective countries usually play in their own currency, or in a currency that is accepted by the casino. When required, the jackpot then adjusts to a currency conversions at the time of the jackpot. You will feel very welcome in this jungle once you start living the excitement of playing for some large progressive jackpots. Even the regular jackpot is very nice, especially when betting the maximum amount, which means there will be plenty of reasons to enjoy a visit to the jungle of Mega Moolah in the near future.